Post graduation in any field seeks in depth study & a detailed perspective about the particular subject in which one desires to pursue his post graduation. It should ideally enable the person to be an authority in his specialty and expects him to be an encouraging teacher, a philosopher & guide to the younger generation, in the coming years a scientist with an analytical mind & to inculcate in him a research oriented approach in his studies. The college is conducting Post-graduate courses in various disciplines of Ayurved since the year 2008. Initially there was PG programme in three subjects only. Now, Post-graduation is available in 7 subjects (details as below), moreover 5 subjects are under process for PG programme. All the facilities like recognized P.G. guides, Teaching staff, Hospital, Library, Laboratories, Computer hub, Pharmacy etc. are available for efficient conduction of PG courses. All the P. G. courses are recognized by Dept. of AYUSH of Ministry of Health and Family Welfare of Govt. of India and CCIM, New Delhi, and affiliated to M.U.H.S. (Nashik). 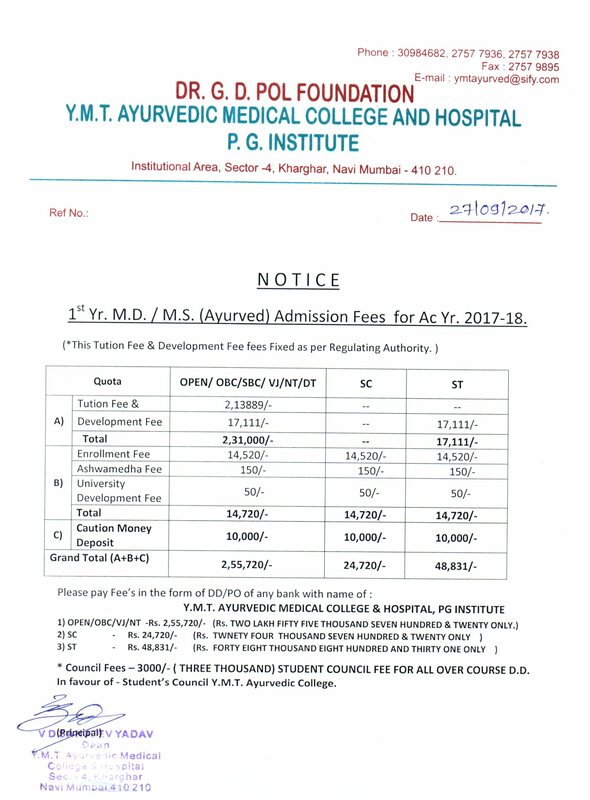 Following are three year full time Post Graduate courses under the affiliation of Maharashtra University of Health Sciences Nashik leading to P.G. Degree. On the basis of merit as per PGA – Asso CET. One examination after one year i. e. Preliminary examination. Final examination at the end of Three years.